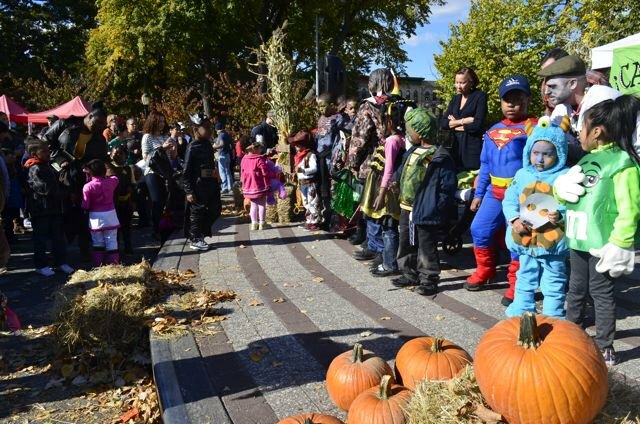 Bushwick families flocked to Maria Hernandez Park on a sunny Sunday afternoon for this year’s Calabazafest!, a community fall harvest festival put on by Bushwick Farmers’ Market and its parent non-profit organization EcoStation:NY. 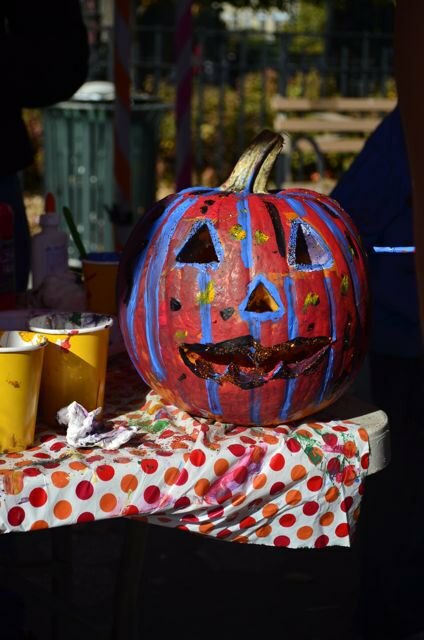 The event featured seasonally-themed activities for kids, including pumpkin carving, face painting, an arts and crafts workshop, and a costume contest. Some of these activities also had an educational aspect related to EcoStation’s mission: the Bushwick-based non-profit works to promote access to fresh, locally grown produce and raise awareness of the connections between the food system, the environment, and health among Bushwick’s low-income population. 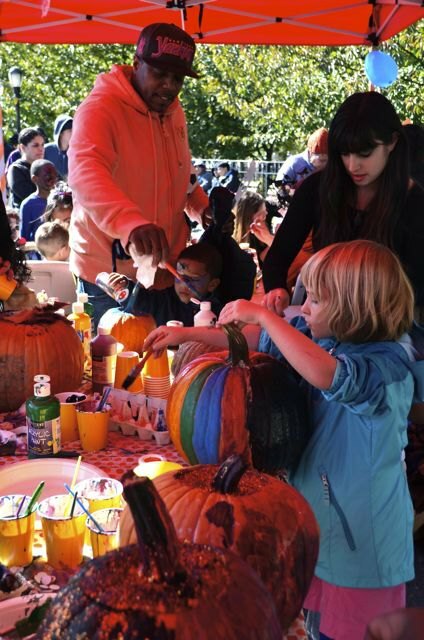 Asked what they were most excited to do at Calabazafest!, brothers George and Brian Flores, ages 10 and 9, said unequivocally, “pumpkin carving.” This was a wildly popular activity. Alex Hodgkins of Arts in Bushwick, whose volunteers were painting faces and helping run the pumpkin carving and painting booths, told us that they went through their entire supply of pumpkins within just an hour. After carving the pumpkins, the kids composted their carved-out pumpkin remains with the guidance of EcoStation’s Director of Farms and Education, Maggie Cheney. “It’s all about the worms,” said Cheney, explaining the composting station’s appeal. Worms were added to the compost bins (they play an important role in creating nutrient-rich compost) and the kids loved letting the slimy little creatures squirm around in their hands. 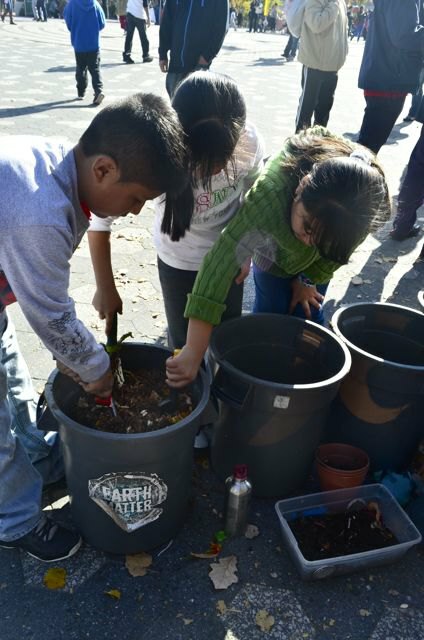 The Bushwick Eco Action Network (BEAN) ran a booth where kids made headdresses and other creations using leaves and fruits harvested from trees in the neighborhood. BEAN’s Abby Lee explained that they were using these arboreal materials to celebrate Bushwick’s all-too-sparse supply of trees, and to encourage people to take responsibility for our trees’ well-being. BEAN offers tree-care workshops for people in the community, and coordinates other efforts to promote the greening of Bushwick. 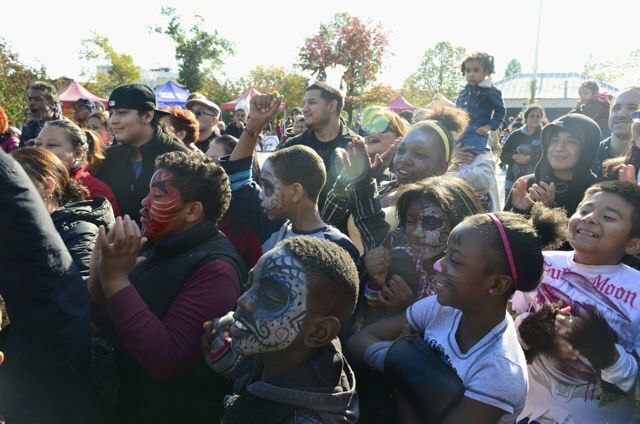 EcoStation’s Director of Markets, Travis Tench, credited the collaboration of partner organizations like BEAN and Arts in Bushwick with the success of this year’s Calabazafest!. Other co-creator organizations included Make The Road New York and El Puente. The beautiful fall weather didn’t hurt either; last year the event had to be postponed due to Hurricane Sandy, and the year before that it was disrupted by a rare October snowstorm and moved indoors. 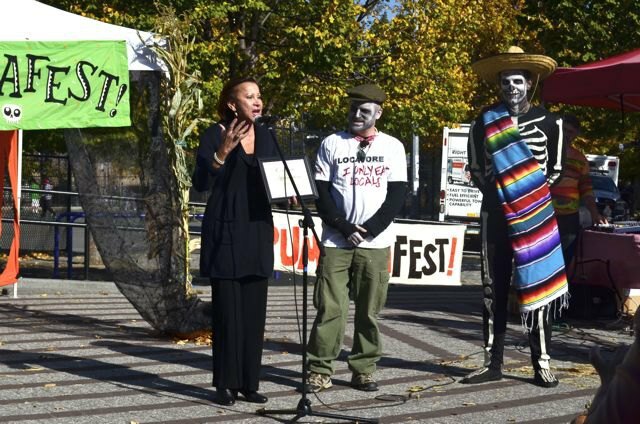 Tench was fully costumed - facepaint and all - as the mariachi skeleton featured in the event promo, and clearly enjoying his role as mascot and emcee. He gave us a sneak peek at Bushwick Farmers’ Market’s new Green Machine, a truck and mobile market unit recently converted to run on recycled veggie oil thanks to a grant from the U.S.D.A.’s Farmers Market Promotion Program, which would later be officially unveiled to culminate the day’s festivities. A sneak peek at the "Green Machine"
EcoStation Executive Director Sean-Michael Fleming took the stage to introduce a special guest of honor: U.S. Congresswoman Nydia Velázquez! Velázquez represents New York’s 7th congressional district, which includes most of Bushwick. She called it “a great day for the Bushwick community” and praised the festival for “celebrating the important role that food has in our lives.” Velázquez emphasized the connection between food and health and spoke passionately of her support for the Affordable Care Act (also known as Obamacare), which recently survived Republican threats to its implementation during the federal budget impasse. We had a chance to speak with the Congresswoman personally after her speech and she expanded on her support for projects addressing the connection between food and community health. “[Bushwick] is a food desert,” Velázquez told Bushwick Daily, but added that this was changing little by little. She spoke proudly of her support for farmers’ markets in her district and said that her office had assisted EcoStation’s efforts to obtain the U.S.D.A. grant for the Green Machine, placing phone calls and writing letters of recommendation on their behalf. With weighty but important discussions about social policy out of the way, it was time for some lighthearted Halloween entertainment. To close the day’s festivities, the Green Machine was driven into the center of the plaza while the opening howls of Michael Jackson’s “Thriller” played through loudspeakers. 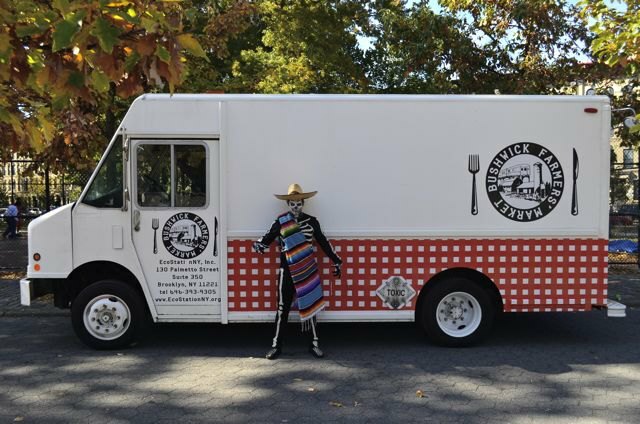 Kids and adults from the community, costumed as various kinds of undead, congregated in front of the truck and performed a version of the dance featured in the song’s famous music video, and a tarp was dramatically pulled away from the side of the truck to reveal the Bushwick Farmers’ Market logo. As promised, it was a "thrilling" conclusion to this year's Calabazafest!.